In 2010 I was very pleased with the autobiography/coffee table style Bobby Hull book The Golden Jet. In similar format author Bob Verdi and publisher Triumph Books are back with Stan Mikita in 2011 with Forever a Blackhawk . It is every bit as good, and, unfortunately, equally under the radar. This is a fantastic book worthy of your consideration. The as-told-to autobiography reads a little-too simply, but Mikita`s story carries the book. Like how as a kid in the former Czechoslovakia German troops occupied his home during World War II. Or once he moved to Canada, he loved to play the game but had no early connection with the NHL. When Rocket Richard, Boom Boom Geoffrion and Doug Harvey showed up at his school to sign autographs, he had never heard of them! Then of course there is all the stories of Bobby Hull and the Scooter Line and the Chicago Blackhawks. It is a fascinating read for any fan of Stan Mikita and the Chicago Blackhawks. The name Stan Mikita is synonymous with greatness when it comes to hockey in Chicago and throughout the NHL. As one of the most charismatic and electrifying athletes of his or any era, Mikita thrilled fans with his unique combination of speed, skill and toughness. Along the way, he became known as one of the finest centers in hockey history and is still widely regarded to be the best at his position of the 1960s. 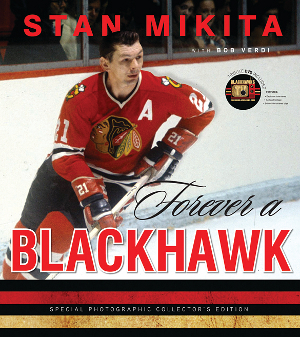 Featuring hundreds of rare, full-color photos from his personal archive and accompanying text from legendary Chicago sports columnist and Blackhawks team historian Bob Verdi, Forever a Blackhawk gives Mikita's millions of fans a never-before-seen glimpse into the life of this hockey icon. Bringing the pictures to life is an exclusive commemorative DVD, which includes highlights, interviews, and behind-the-scenes clips from the Blackhawks' video library. A must-have keepsake for Blackhawks fans of all ages, Forever a Blackhawk is a rare opportunity to celebrate the life of one of the greatest hockey players in Chicago's history. It is truly a must have for old time fans of the Chicago Blackhawks. Joe, A very nice review about my all time favorite hockey player "Stosh" #21 Stan Mikita!.. I have of course read the book and Stan as usual comes across very humble and just an average guy until he got a hockey stick in his hands and took the ice!...I have his first book "I Play to Win", and my mom bought me that one for my birthday when I was in high school!That one an excellent book also!... Stan will always be the man for me when it comes to hockey!...The Magician!